"Official Mascots of The Beach Boys: Camp California." Really, 'cause I've never heard of 'em, you're no doubt saying. Well don't feel bad, because there's almost nothing on the internet about this early '90s multimedia Beach Boys property. 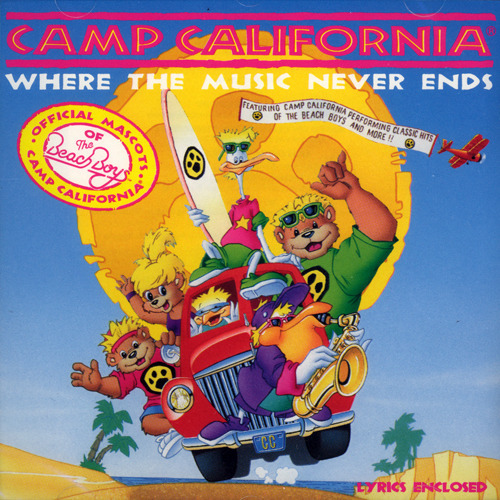 I'd be tempted to call Camp California an abortive attempt at a kids' Beach Boys IP, but there's only one sense in which it's really "abortive": there was never a TV cartoon. Instead, this short-lived little franchise consisted of an oddly disembodied kiddie cover song CD (pictured above) and two video games for the Turbografx-16, a late '80s, early '90s console that beat the SEGA Genesis in Japanese sales but only had about one or two games that the US market seemed interested in playing (remember the "Bonk" series?). 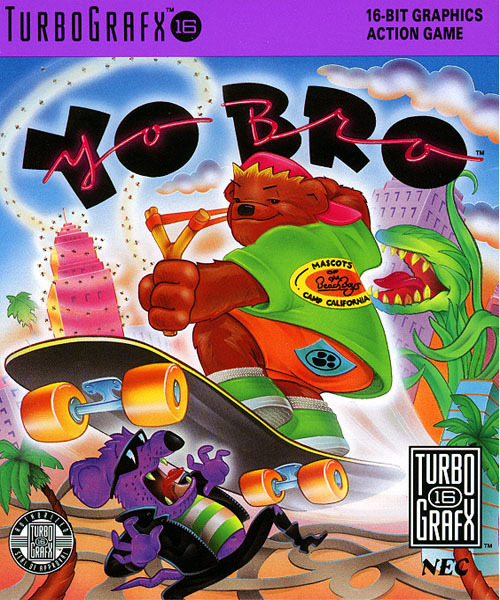 I first stumbled onto the 1991 video game in this, uh, I guess you could call it a series, called "Yo, Bro." There's a gameplay video up on YouTube here. The start screen immediately hits you with "I Get Around" by the Beach Boys, followed by "Fun, Fun, Fun," "Help Me, Rhonda," and "California Girls" if you let it sit there long enough. I thought it was some kind of rip-off at first, but the chiptunes are really well-done. Nothing else in the game seems to really allude to The Beach Boys, but if you look at the box (pictured on the right) you'll see that some "Official Mascots of the Beach Boys" logo on the ursine, skateboarding main character's shirt. In the game, you must save various California cities from Professor Liverhosen, who is attacking area children with bees, zombies, airboarding dogs, and Audrey II-esque plant monsters. You skate around much like other 8 and 16-bit era skateboarding games, but with an assortment of weapons to awkwardly fire at your opponents, mostly different kinds of slingshot with the less G-rated option of grenades thrown in there as well. Today, I found there was another video game in 1993, titled "Camp California." This one utilized the Turbografx CD system, allowing for true audio and entirely new gameplay. This one I haven't been able to play yet, so all I've got to go on is this Turbografx promo video and a video of the game's intro. One copy of the game is on eBay for over a hundred dollars, but I'll keep digging before I resort to that. The significantly cheaper key to this Beach Boys ephemera mystery was the music CD I mentioned earlier, which arrived in my mail at the cost of four entire dollars this afternoon. Let me tell you, it's odd to hear scripted cartoon character dialogue featuring easily recognizable 90s voice actors prefacing well-produced if empty-spirited Beach Boys covers and original songs, all presumably for a cartoon that never came to exist. This CD, "Camp California: Where the Music Never Ends" features the voice acting work of Nancy Cartwright (Bart Simpson), Jess Harnell (Wakko from "Animaniacs"), Hal Rayle (Raphael from "Teenage Mutant Ninja Turtles"), and Kath Soucie (Linka from "Captain Planet"). The music's arranged by Gordon & Lisa Goodwin, who did music for things like "Animaniacs" and "Ferngully," so again, right in that fairly high-rent '90s cartoon talent wheelhouse. The characters were created by Edward Garner and David Fontana, presumably the same David Fontana who directed the animation for Rugrats. As much as I'd like to play 6 Degrees all day, you get the point that a lot of typical cartoon guys all worked on this weird cover CD that didn't actually have a cartoon to go along with it. You can probably imagine how the music sounds, it's the kids' music genre. The all-important backing vocals and instrument layering of Beach Boys music is chintzy but not bad. The Beach Boys tracks (and "Little Old Lady From Pasadena," "Surfin' Bird," and "Wipe Out," the three other beach craze standards got shoved in here, too) aren't ruined by the arrangements so much as by the voice actors, who ham it up and screech and ad lib whatever their characterizations are supposed to be before, during, and after each song. Two original songs, "Camp California (Where the Music Never Ends)" and "Kelly's Song," are just sort of tolerable additions that wouldn't sound out of place on an '80s Mike Love record, for whatever that distinction's worth. Besides the voice actor-only moments before a few songs, and some punishing female lead vocals, it doesn't curl your hair like an early Kidz Bop CD, but, you know, it is what it is. Why is all this sorta-decent '90s kids stuff so completely unheard of? Where's the cartoon? How involved were the Wilson-less cash-in '90s Beach Boys in approving this "official mascot" business? Did they really think that the Turbografx-16 would be a good platform to launch a new multimedia IP? I am infinitely curious about this mediocre crap, and I want answers. We'll see what I can find out.